SPES’ Robyn Worcester was one of the presenters at a town hall meeting in Vancouver on Thursday night, hosted by the Wilderness Committee and Tanker Free BC. Stanley Park is the jewel of Vancouver, and one of the largest, most ecologically diverse urban parks on the planet. The area has already been heavily impacted by increased industrial and shipping activity, but an oil spill in Burrard Inlet or the southern Georgia Strait would absolutely devastate the park and its marine ecosystem. 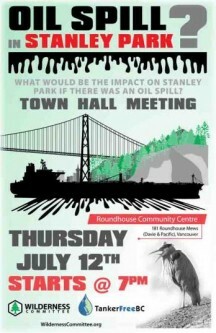 Robyn joined Ben West from the Wilderness Committee, Niki Sharma from Vancouver Park Board and Chief Rueben George from Tsleil-Waututh Nation, and they discussed the impacts of an oil spill on Stanley Park. SPES contributed to a report on oil spills and Stanley Park that was recently published by the Wilderness Committee; read more here.